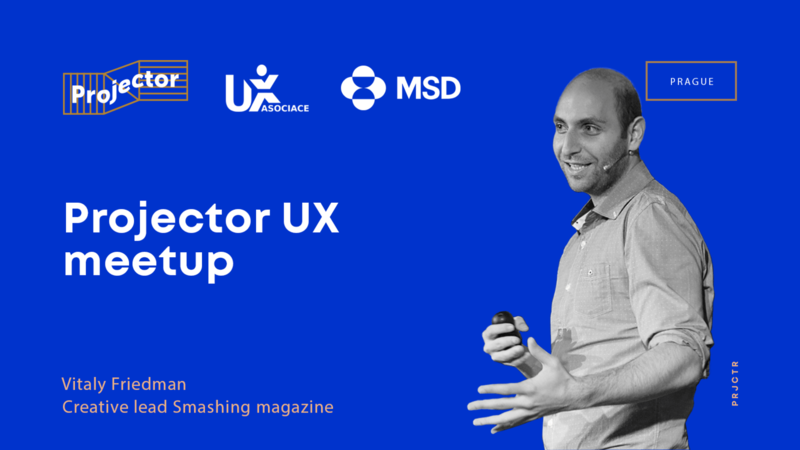 Projector Prague, Asociace UX and MSD are glad to invite you to our first UX meetup in Prague. Our first guest will be Vitaly Friedman, creative lead at Smashing magazine, design consultant and front-end developer. We'll talk about Smart Responsive Interface Design Patterns. If someone asks you to build a responsive accordion, you'll figure it out. The same goes for a table. Or a calendar. Or, God forbid, a multi-level-mega-drop-down. But how would you go around slightly more complicated components? What if you had to build a sophisticated car configurator with a real-time updated 3D view? What about an advanced mortgage calculator? How about a feature comparison table, a music festival schedule, an election map, an airfare booking and check-in, a live world football championship leaderboard and a theatre map seat selection? In this session, we'll take a microscopic examination of common interface components and problems appearing in responsive user interfaces. We'll cover them all: both from the design and from the development perspective. Keep in mind: you won't be able to unsee the things you'll see in this session. Yes, it's going to be dirty, tricky and horribly annoying at times. You'll leave with a toolbox of practical techniques that you'll be able to apply to your work right away. And potentially some tips for saving money on airfare, too!